Diablo Cody on the set of "Paradise." Diablo Cody at the 11th Annual Hollywood Awards. Diablo Cody at the Fox Searchlight party during the Toronto International Film Festival 2007. Diablo Cody at the photocall of "Juno" during the 2nd Rome Film Festival. Diablo Cody at the 8th Annual AFI Awards. 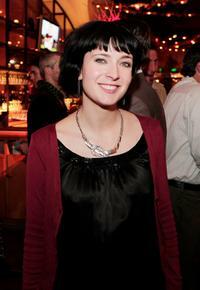 Diablo Cody at the 2007 National Board of Review Awards Gala. Diablo Cody at the afterparty of the premiere of "Juno." Diablo Cody at the 2008 Palm Springs International Film Festival Awards Gala. Diablo Cody at the 2008 Film Independent's Spirit Awards. Diablo Cody at the IFC party celebrating The Spirit of Independent Film. Diablo Cody at the Orange British Academy Film Awards (BAFTAs). Diablo Cody and Ellen Page at the Centerpiece Gala screening of "Juno" during the AFI FEST 2007. Diablo Cody at the photocall of Official Awards during the 2nd Rome Film Festival. Jason Reitman and Diablo Cody at the photocall of Official Awards during the 2nd Rome Film Festival. Diablo Cody at the premiere of "Juno" during the 2nd Rome Film Festival. Diablo Cody at the Centerpiece Gala screening of "Juno" during the AFI FEST 2007. Diablo Cody and Daniel Dubiecki at the Centerpiece Gala screening of "Juno" during the AFI FEST 2007. Diablo Cody at the premiere of "Juno" during the BFI 51st London Film Festival. Allison Janney and Diablo Cody at the premiere of "Juno" during the BFI 51st London Film Festival.